There are an estimated 285 million visually impaired people globally, with 39 million of them blind (Pascolini and Mariotti in Br J Ophthalmol: bjophthalmol-2011, ). Nearly 10% of the estimated 1.1 million blind people in the USA use a long cane and just under 1% a guide dog. 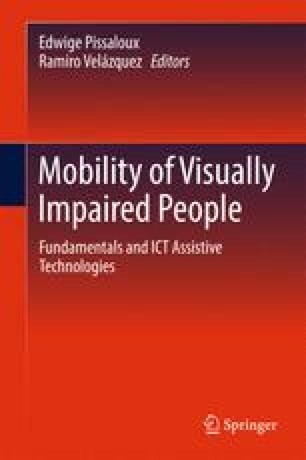 The chapter discusses the importance of mobility for participation in society and the factors that can lead to the inclusion or exclusion of blind, partially sighted and deafblind people. Exclusionary fctors include lack of full accessibility of public transport and continuins stigma which can affect the use of mobility technologies. Recommendations for the design of accessible environments to increase the participation and inclusion of blind, partially sighted and deafblind people are proposed and accessible public transport and pedestrian crossings are discussed.